26 PEOPLE HAVE been rescued from the River Foyle after a boating event went badly wrong. The event, a fundraiser for the local YMCA, saw two kayaks that were participating capsize. Foyle Search and Rescue (FSR) conducted the rescue of the 26 people, aged between 18 and their mid-50s, in conjunction with both the Irish and UK Coastguards and the North’s emergency services. The incident happened on the stretch of river between Carrigans in County Donegal and Magheramason in County Tyrone on the river Foyle. An Irish CoastGuard Helicopter airlifted five of the boaters who were worst affected by the freezing water to Altnagelvin Hospital in Derry, while 12 others were taken by ambulance. The hospital subsequently confirmed the casualties were being treated for hypothermia. Local SDLP MLA Mark Durkan commended the efforts of the various emergency services involved. “I must commend the swift and brave actions of Foyle Search and Rescue, The Irish Coast Guard and all the emergency services whose efficiency and professionalism certainly saved lives,” he said. It has been a cold day and the water in the river would have been freezing. Coupled with the strong current and high tide it is extremely fortunate that we did not witness a tragedy here today. Email “26 people have been rescued from the freezing River Foyle after their canoes capsized”. 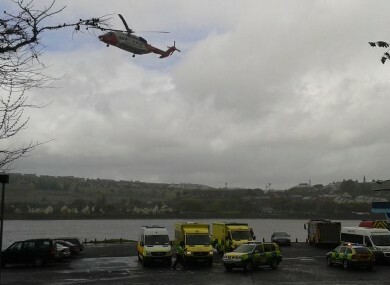 Feedback on “26 people have been rescued from the freezing River Foyle after their canoes capsized”.